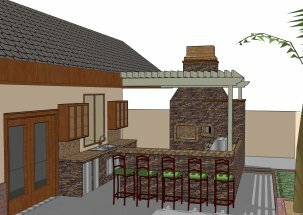 Computer modeling has been proven a very effective tool in outdoor kitchen design. It helps clients to understand the relationship between different design elements in a visual format. 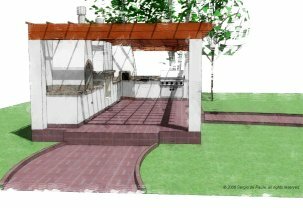 Modeling is also specially helpful in determining the effectiveness of pergola and roof designs. 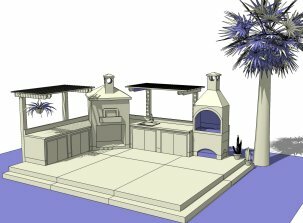 Many of the outdoor kitchen designs shown in the following images have been built or are in various stages of development. 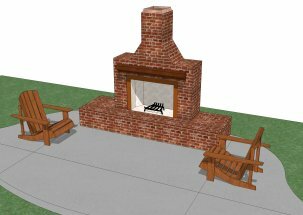 Some are simple design studies that our staff have come up with to help our customers to visualize how different elements might complement a design. 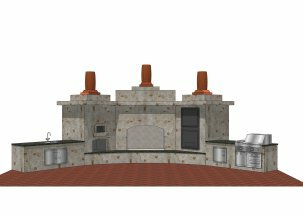 This outdoor kitchen plan, in Dove Canyon, California, is an L-shape design with serving counter, that also includes a Model 1050 wood fired oven, a 53” Viking gas grill, a sink, and a refrigerator. You can see from the design on the left and the image of the finished kitchen on the right, the design was well executed and the kitchen looks very much like the original design. This is a simple, small and very efficient design done by one of our architects. 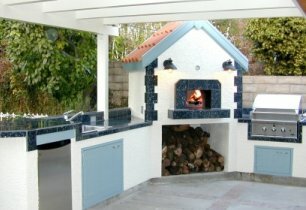 She combined a Model 850 wood fired oven, next to a Model 515 barbecue with a serving counter for up to six guests. This kitchen design was built at her home, in West Los Angeles California. 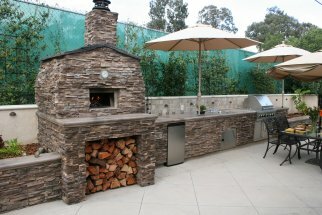 This outdoor kitchen plan, in La Cañada, California, was completed in 2004. 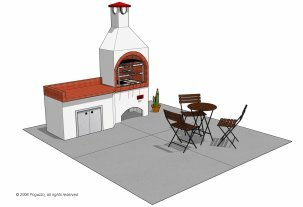 It is a simple, L-shape design that includes a large wood fired oven, a gas grill, a sink, a small refrigerator, and plenty of under counter storage. As you can see from the design on the left and the image of the finished kitchen on the right, the design was well executed and the finished kitchen looks very much like our original design. The homeowners also added a pergola since its completion. 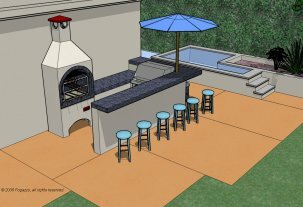 This is a complete outdoor kitchen design that includes a wood fired oven, a gas grill with side burner, sink, refrigerator and plenty of storage. Place for two large umbrellas provide some much needed shade for the cook on a hot summer day. This kitchen was completed in 2006. 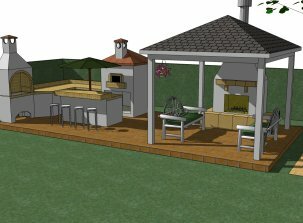 This very unique and absolutely beautiful outdoor kitchen design was commissioned to us by the homeowner. 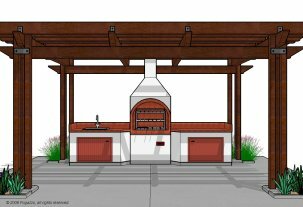 It includes a Model 850 wood fired oven, a large outdoor fireplace as its center piece, a smoker, gas grill and plenty of storage. The real clay chimney pots, on top of the all stone structure add real style to the design. The project is close to completion. 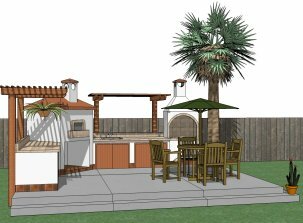 This is a fairly basic outdoor kitchen design that includes a wood fired oven, a churrasco bbq, a sink approximately 16 linear feet of counter space, and two small pergolas over the counter areas. 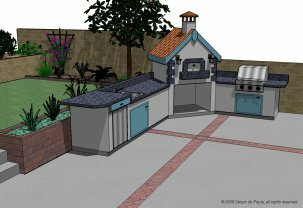 The whole design sits on a 14’ x 16’ concrete slab which is raised 1’ higher than the surrounding yard. 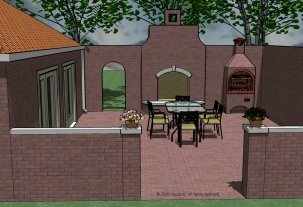 This is a more complex outdoor kitchen plan, that includes a covered living room with a fireplace. 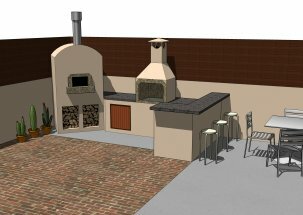 In addition to the L shapped outdoor kitchen design, that included a wood fired oven, and a churrasco bbq as well as a raised seating area. 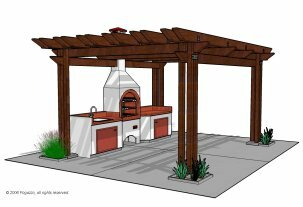 This is a complete outdoor kitchen that includes a wood fired oven, mesquite bbq, gas bbq and a fireplace. The overhead cover is a pergola that can be covered with a canvas as well. 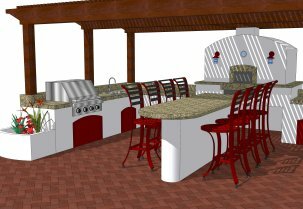 These two images are of a design study for a Model 525 Churrasco BBQ flanked by counters on each side. 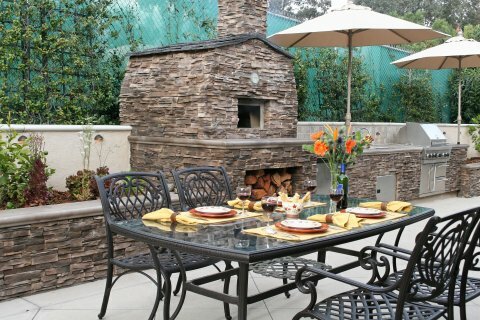 The open are in front of the outdoor kitchen is meant to fit a family sized table. 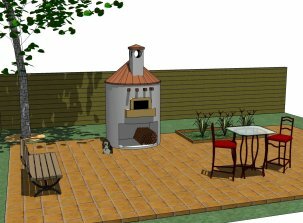 The image on the left is a courtyard with a large wood burning fireplace and a Model 525 barbecue finished in brick veneer to match its surroundings. 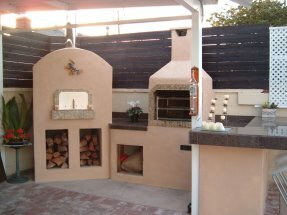 The image on the right is a variation of the La Canada outdoor kitchen above, with a mesquite barbecue in place of the gas unit that was built into the original kitchen. The serving countertop was also expanded on this version. 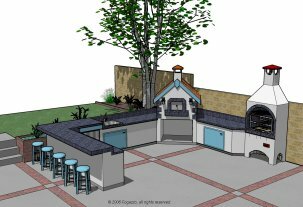 It is currently being built in this configuration with and additional pergola over the seating area as you will see below. 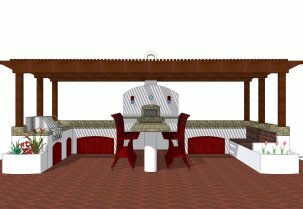 The image on the left is considered to be the simplest island style for one of our bbq models, it is just a storage cabinet with a countertop placed next to the Model 525 barbecue. 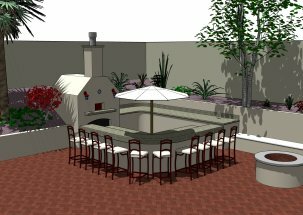 The image on the right is a design study for a Beverly Hills, California client who entertains a lot but does not feel the need to use a wood fired oven since most of his cooking is on the grill. 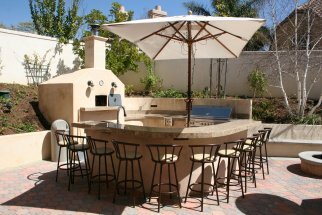 This small area includes a 36 inch gas grill in addition to the Model 525 churrasco barbecue. 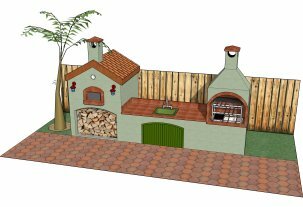 These are illustrations for an Ohio contractor that asked us to create 3d images so he could show his clients what their outdoor kitchen would look like once finished. The materials to be used are still under review, but the overall layout should be very close to what we see here. 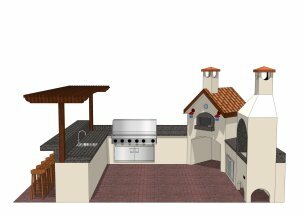 The image on the left is a concept yet to be built, the design on the right should be built in 2006 in the Hollywood Hills area of Los Angeles and includes a Model 515 bbq, a side burner, sink, and stainless steel access doors. 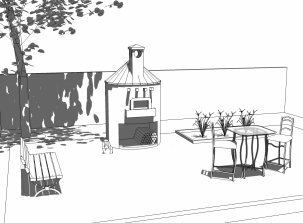 This is an outdoor kitchen design study to explore the possibilities for building a cylindrical wood fired oven installation. 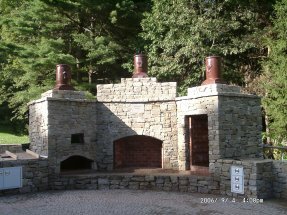 The chimney flue is a trademark design by Sergio de Paula for Fogazzo Wood Fired Ovens. The design study on the left was done for a customer in 2006 and is likely to be built in 2007. 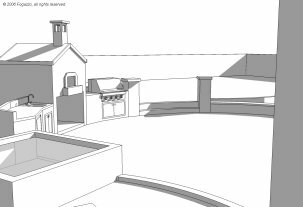 The outdoor kitchen plan on the right is under review in Orange County California and is likely to be built in 2007. 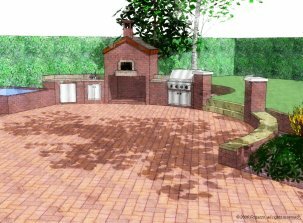 This outdoor kitchen plan is currently under construction and is scheduled to be completed in 2007. It includes a large bar height serving table in front of the Model 850 wood fired oven. 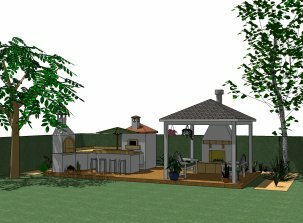 It also features a 36 inch gas grill opposite a seating area with cushions, lots of counter and storage space and two rounded planters at either end, all under a large redwood pergola. 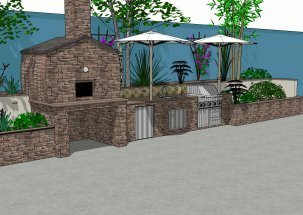 This is the variation of the La Canada California outdoor kitchen plan that has been built several times with small variations. This version is currently under construction. This is extra wide outdoor area measures almost 50 feet from the planter on the left to the serving height counter on the right. The space includes a Model 333 wood burning fireplace, a Model 850 wood fired oven kit, a 42 gas grill and a serving counter for up to eight guests. Again, computer modeling allows for design flexibility from the planning stages all the way through the construction process. 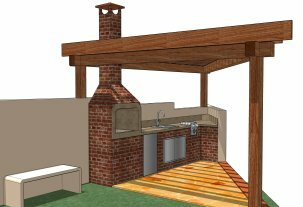 Outdoor kitchen designers, builders, and owners benefit greatly from the array of software and design tools currently available. 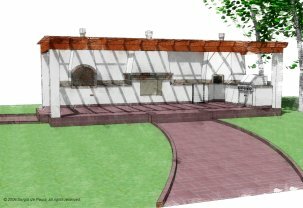 FREE OUTDOOR KITCHEN DESIGN ASSISTANCE!